As the days progress, more and more people focus on their office work and end up neglecting their fitness. But they realize their ignorance towards fitness and start searching for decent fitness centers and gyms. Are you a gym owner or a fitness trainer with sound knowledge but constantly failing to generate loyal customers for your services? This is a common problem that most of the fitness personnel face and to that we suggest the usage of MailGet Bolt’s email templates. ⇒ Its cost effectiveness will help you in saving up a lot of money. ⇒ The templates being responsive guarantees maximum user access. ⇒ With 99% delivery rate it assures utmost brand exposure. 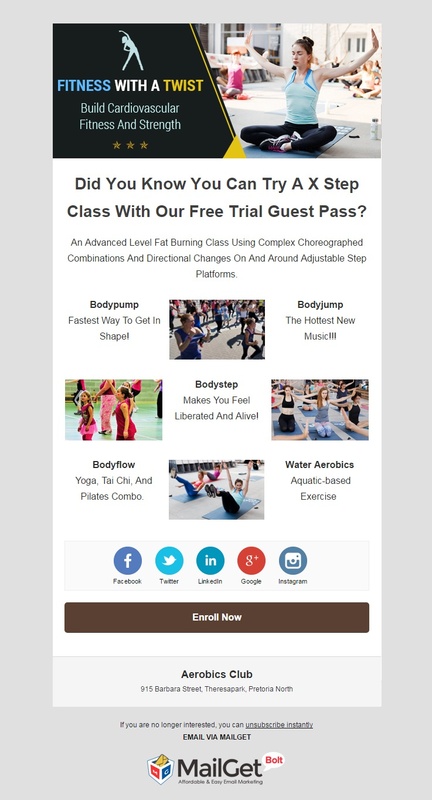 So for the purposes of getting your services and fitness centers a jump start, we suggest you glance over a freshly compiled list of best fitness email templates. 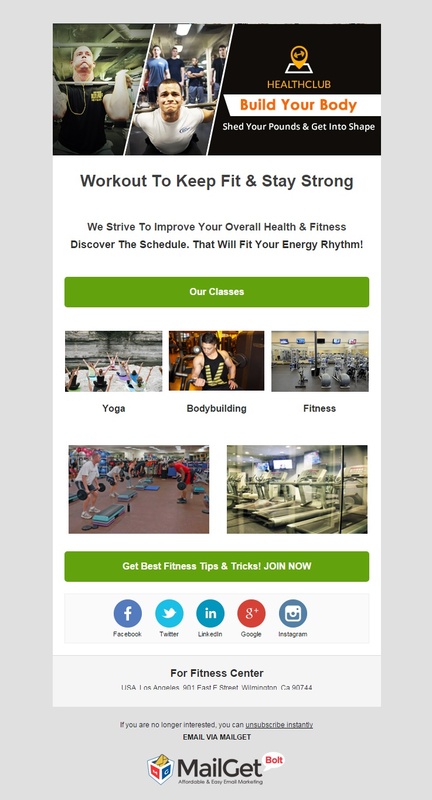 Boost up and promote your fitness related business with 10+ Best Fitness Email Marketing Services For Gyms, Health Clubs, Fitness Centers & Trainers. 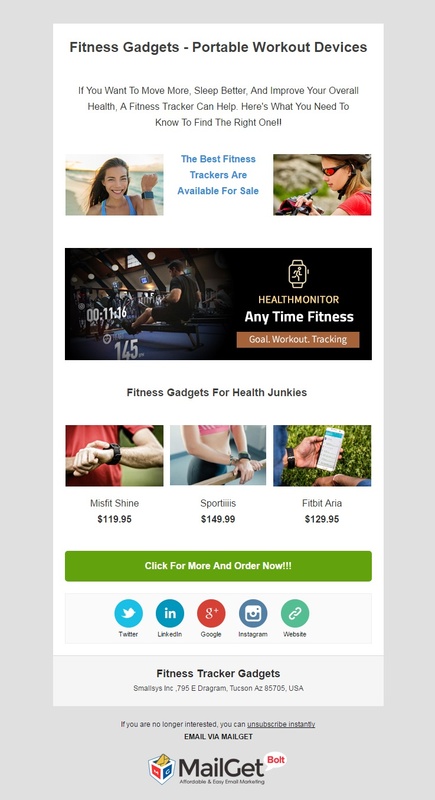 Perform all the promotional activities of your fitness gadgets store by sending informative email templates to your leads. The e-template designing process can be taken care with the help of drag & drop email builder, which allows quick construction just by dragging and placing required fields in the template’s layout. 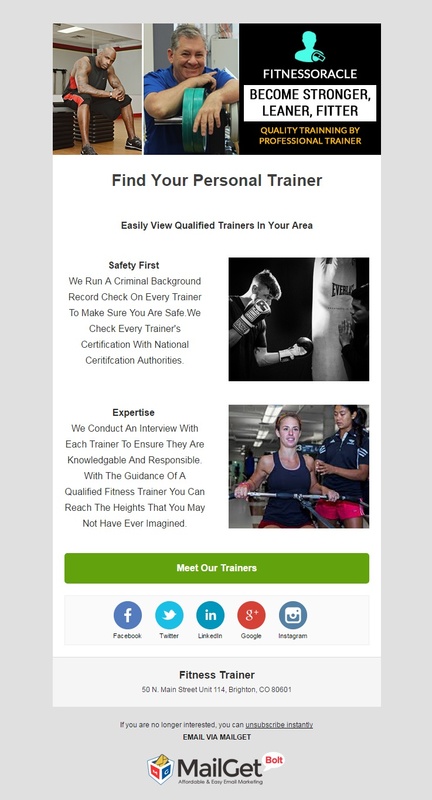 This email template is the synonym of success for your fitness center as it is packed with highly productive features. One such feature is the choice of embedding a subscription form. Through this form, you are destined to generate a lot of leads which will surely turn into loyal customers if they are nurtured properly with effective marketing strategies. 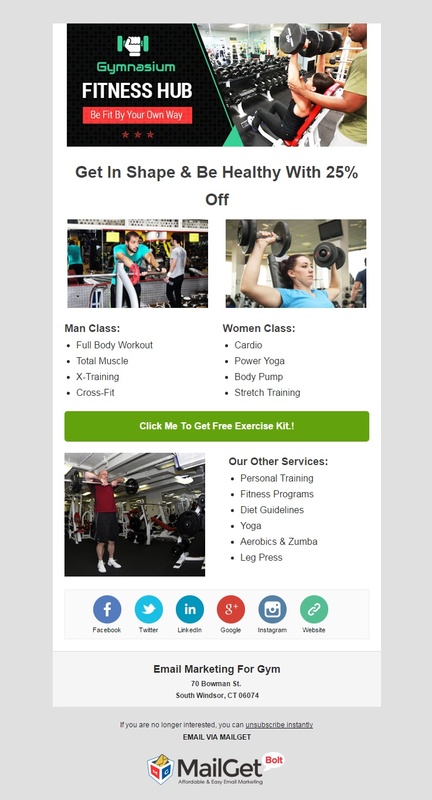 With the mass transmission of this email template, you can advertise your gym and the services it provides to various audiences. The e-template is dispatched with the massive 99% inbox delivery rate and with such a high percentage, you are bound to spread the word about your gym more effectively than ever. 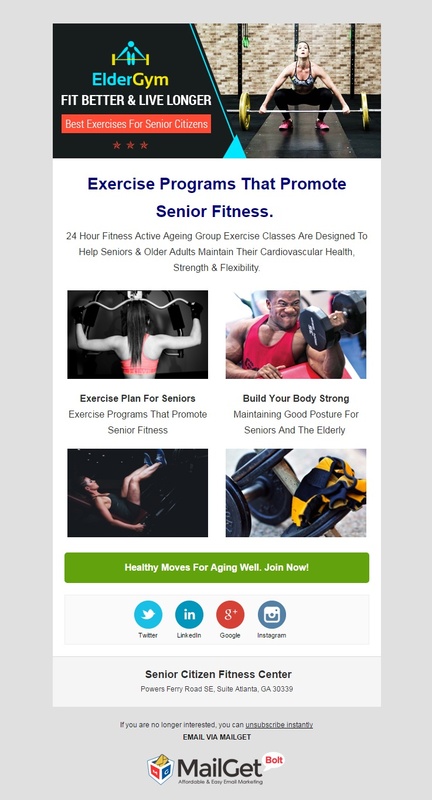 The email template for senior citizen fitness centers will help you broadcast your services to the right audience. This can be achieved with an automated email sending process called as drip emailing mechanism. All you have to do is set a triggering date/time on a set of email campaigns and the dispatching will commence automatically. Enhance your weight losing centers by sending highly informative and visually charming email templates. In order to reduce your workload, you can activate the email sending process through scheduling the email functionality. This is an automatic email sending mechanism where you just have to schedule your emails according to your desired triggering date and time. Increase your reach for your bodybuilding training services by constantly keeping in touch with your clients through this email template. The e-template allows you to grow a personal relationship with your future and existing clientele as you are enabled to address them by their names, just by using few generic taglines of personalized tags. 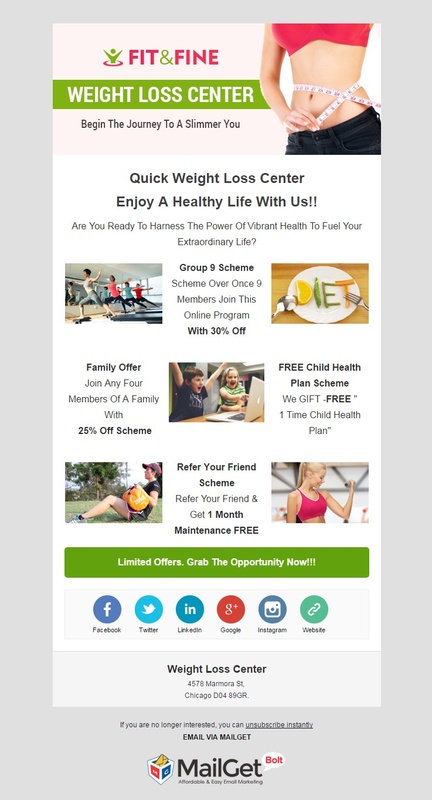 You can draw a large number of youth and youngsters at your fitness club, designed specifically to cater their need with the help of this email template. Not only this, you can categorize your customers with help of subscriber segmentation feature and effectively target them according to their needs and health requirements. 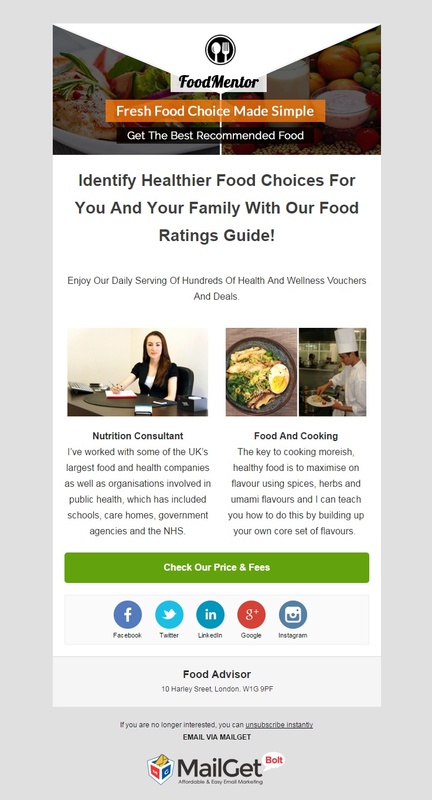 Educated your current clients and leads with the knowledge of food and nutritional intake with the help of this email template. The e-template facilitates you to manage your emailing list so that all the faulty and inactive email addresses are sorted out of the current email addresses. This effective management optimizes your reaches and encourages high response rate too. 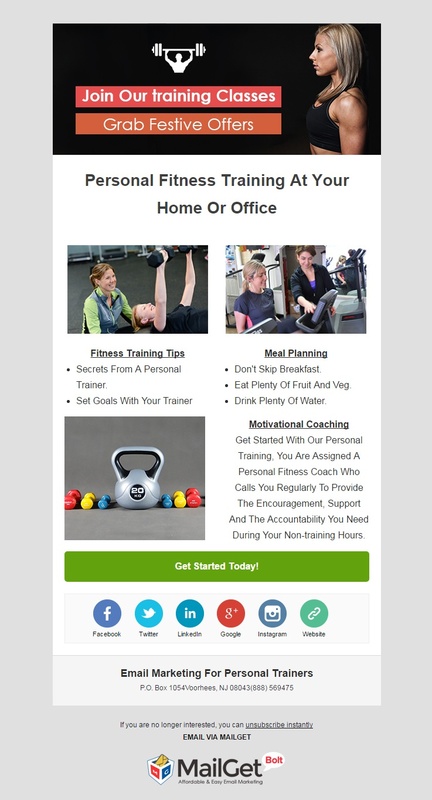 Amplify your personal training business with the help of this email template. The proper usage of this email template, along with decent marketing strategies enables you to gather a decent crowd at your door steps. Email Template can be sent as an auto follow up email and it will be delivered to those subscribers who hadn’t opened your previous emails, hence improving the brand awareness among the leads. 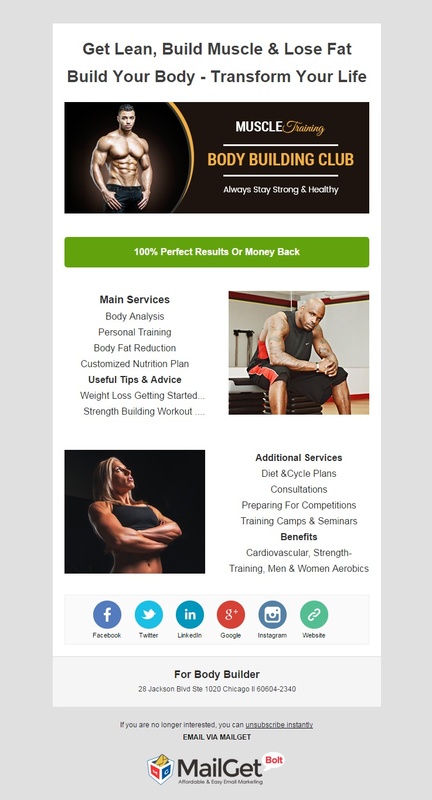 The email template, designed especially for personal trainers is highly productive in taking your services to a new level. Despite being capable of reaching 99% of the inboxes, there are other shareability options too that would spread the word about your services in the desired way. An array of social media icons is one such example, which allows you to promote your personal training services on the social media circuit. Prepare to attend the massive audience gathered at your aerobic club, after they got to know about it through this charming email template. The e-template is integrated with a call to action button which when clicked on, redirects the user to your website. Along with this, you are also able to monitor the status of your sent e-templates with the help of email tracking feature. 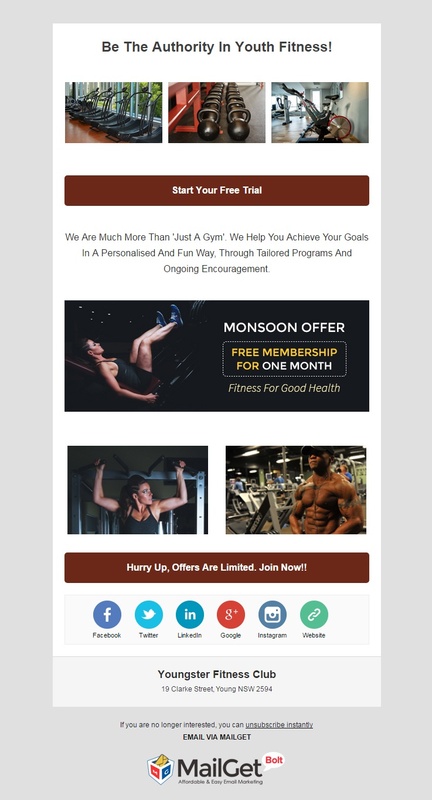 All the email templates listed above has been crafted in such a way that it is highly capable of promoting your fitness center/service and establish a credible brand name. Although we provide a cloning option for every email template, still you want to design email templates from scratch, you can definitely do it with MailGet Bolt. Also, if you are a person with other occupations like musicians, insurance broker, blogger, etc., you can find a way to promote it.